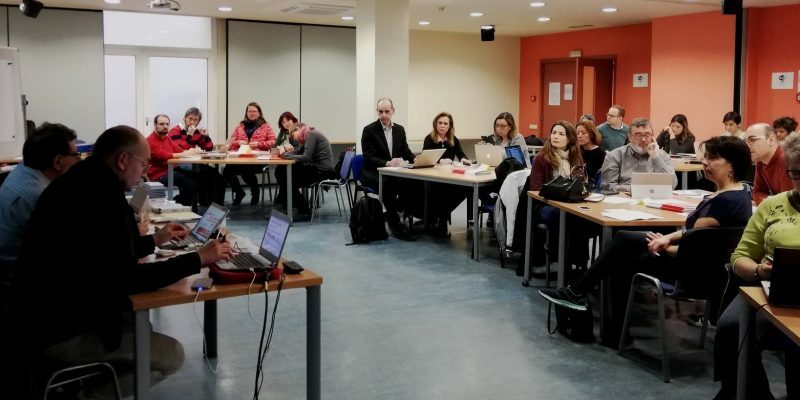 Twenty-five trade union representatives from 20 European countries attended a two-day training organised by the European Federation of Journalists (EFJ) and the European Trade Union Institute (ETUI), on 21-22 February in Barcelona, Spain. The Spanish union FSC-CCOO, one of the EFJ affiliates in Spain, hosted the worshop. Participants – whether they are current, future or potential union leaders – were asked to reflect on how to build and lead a more inclusive and diverse journalists’ trade union. Inclusive meaning diversity in profiles within it, but also innovative ways to support current forms of journalism and mobilise new categories of journalists. Exercices included mapping the changes in the profession, drawing the profile and competencies of future-oriented union leaders as well as reflecting on concrete initiatives to be implemented at the national level. A follow-up training will take place in Automn 2019.